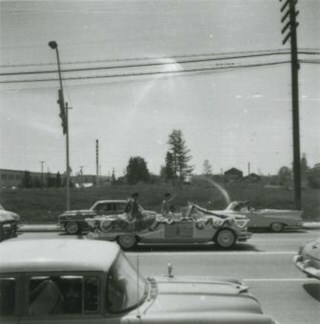 "Burnaby - 4600 Block Kingsway"
Photograph of a float in a parade on the 4600 block of Kingsway. The photo was taken looking southward, and the Kelly Douglas and Co. warehouse can be seen in the background. 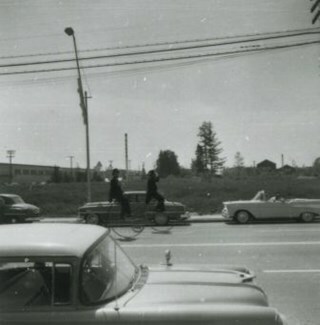 Date at top of photograph reads, "Aug 58"
Photograph of a parade on the 4600 block of Kingsway. The photograph was taken looking south, and the Ford Motor Co. plant can be seen in the background. Photograph of parade on the 4600 block of Kingsway with two people on old-fashioned bicycles. 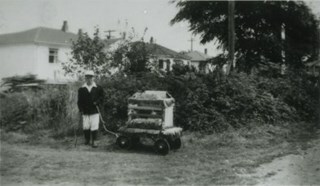 The photograph was taken looking south, and a vacant lot at Sussex Avenue and Kingsway can be seen in the background. 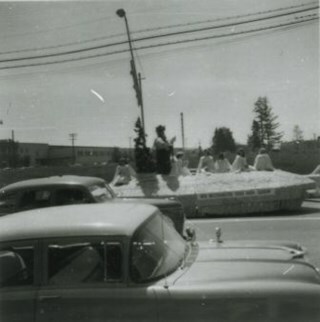 Photograph of parade on the 4600 block of Kingsway showing a decorated car. The photo was taken looking south, and a vacant lot at Sussex Avenue and Kingsway can be seen in the background. 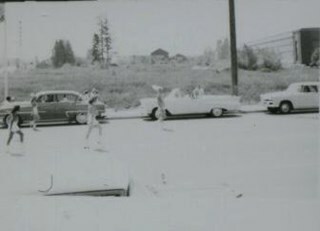 Photograph of parade on the 4600 block of Kingsway showing four women on the road. The photo was taken looking south, and a vacant lot at Sussex Avenue and Kingsway can be seen in the background. 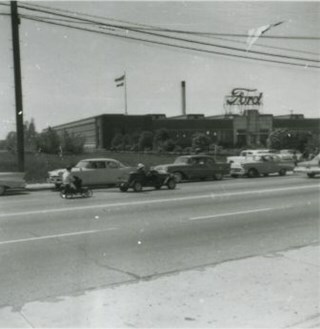 The Ford Motor Co. plant can be seen at the back right. Date at top of photograph reads. "Aug 58"